Running leads to significant cardiovascular benefits, reducing your risk of chronic disease and even increasing your overall lifespan. One of the best aspects of running is that nearly anyone can do it. All that is needed is a good pair of running shoes. 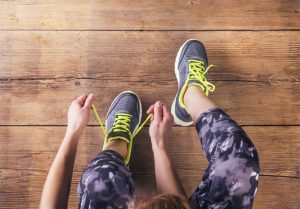 Choosing the right running shoes can make the difference between a pastime that is fun and healthy and one that is painful or even dangerous. Investing in appropriate running shoes now may prevent a visit to an orthopedic surgeon later on. The choice of running shoe depends on your specific foot anatomy as well as your running gait. To get an idea of your gait, check out the bottoms of an old pair of running shoes. This can provide information about whether you pronate (turn your foot inward) when you run. Neutral pronation is characterized by even wear on the shoe sole corresponding to the ball of the foot and a small outer portion of the heel. This is the best running gait for the feet and ankles, as the foot naturally rolls inward a bit after the heel strikes the ground. If you have worn down the inner edges of your shoes, you are an over-pronator. This means that your foot rolls inward when you run. The opposite pattern, excess wear on the outer edge of the shoes, suggests that you are a supinator. This means that your foot rolls outward during each step. Pronators require certain shoe characteristics to correct their tendency to roll the feet inward. Good shoes for pronators may be called stability or motion control shoes. These reinforce the arches and offer stiffer heels. Purchasing supportive insoles is another good way to correct over-pronation. In contrast, supinators should look for neutral shoes with plenty of cushioning. A more flexible shoe with good shock absorption will encourage the foot to naturally roll inward. Choose a shoe that feels well cushioned and supportive. Choosing poor running shoes or running on old shoes can have serious consequences for your body. This may include aching knees, foot pain, shin splints or hip problems. Over time, running with the wrong shoes can lead to injury that takes you out of commission for weeks or even months. Our Jacksonville orthopedics specialists can advise you about the running shoes that are best for your gait and activity level. Investing in good shoes and insoles will keep your feet, ankles and other supporting joints healthy for years to come.